HOUSTON, Texas — Houston area shelters filled to capacity as hundreds of thousands of people flee catastrophic flood waters in the ongoing tragedy of now-Tropical Storm Harvey. Floods that have claimed the lives of up to 15 people continue and concerns shift from flooded roadways to overflowing rivers, creeks, and bayous. A Houston police officer died in his patrol car Sunday morning. Final Live Wire Update, 11 p.m.: Twitter user @CloydRivers Tweeted out a video showing a convoy of boats headed to the flood raveged areas of the upper Texas coast. UPDATE 10:32 p.m.: Fox 26 Houston reports that 18 people have lost their lives in the wake of Hurricane Harvey. Most of the deaths have come from drownings after people drove vehicles into flooded roadways. UPDATE 9:25 p.m.: President Donald Trump pledged to return to Texas to follow up on recovery efforts in the wake of Category 4 Hurricane Harvey. “We are definitely going back to Texas on Saturday and possibly Louisiana on Saturday as well, depending on the weather conditions there,” White House Press Secretary Sarah Sanders told reporters after a meeting between President Trump, his cabinet members, emergency management officials, and their Texas counterparts. “We’ll go back into a different part of the state, to have a chance to see some of the areas we were not able to today,” she said. The president’s team expressed concern that they do not get in the way of ongoing rescue and recovery operations. UPDATE 9 p.m.: Houston Mayor Sylvester Turner ordered a midnight to 5 a.m. curfew. Rescue/shelter volunteers and those seeking shelter are exempted from the curfew. UPDATE 8:40 p.m.: During a briefing by Harris County Flood Control District official and the U.S. Army Corps of Engineers, Meteorologist Jeff Linder said, “For the first time since Saturday night, we are seeing a glimmer of hope.” Tropical Storm Harvey is moving away from the Houston area. At this point, no rain is falling anywhere in Harris County. Officials lowered predictions for the peak height of water in two of Houston’s main storage reservoirs. UPDATE 8:20 p.m.: Photo shows whitecaps on Interstate 10 east of Houston where the San Jacinto River has completely covered the highway. UPDATE 7:45 p.m.: Houstonian gives President Trump two thumbs up on Hurricane Harvey Response. Frankly, I don’t care what the WSJ says. I am a Houstonian, and I give him two thumbs up. UPDATE 6:45 p.m.: San Antonio man travels four hours to Houston so he can spend his 30th birthday serving the victims of the catastrophic flooding that struck the Houston area following Hurricane Harvey, KTLA reports. James Strange and Jordan Gonzales, who both have children, drove about four hours from San Antonio when the realized they magnitude of the devastation. They waded through flooded Houston streets on a motorboat Tuesday, avoiding cars in the water as they looked for people who needed help. “Something hit us close to home and we said ‘we need to go out there and go help.’ We got the resources to go do it, we got the time. Let’s do it,” Strange said. “Everybody is in the same situation. It don’t matter who they are, where they’re from,” he said about the people he was helping. Gonzalez turned 30 on Tuesday. 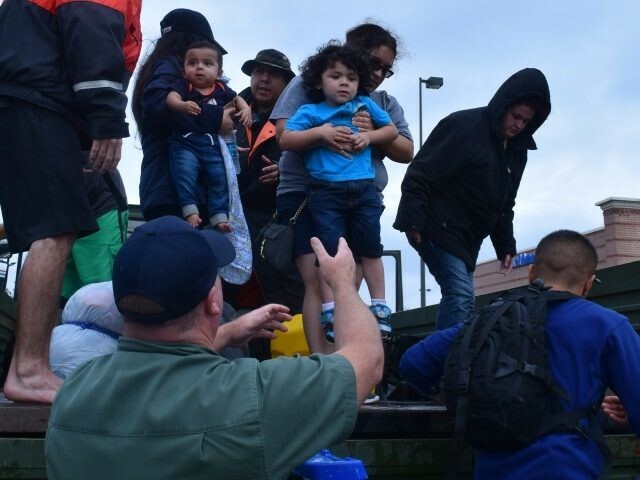 UPDATE 6:15 p.m.: U.S. Border Patrol agents joined the Houston-area flood rescue efforts and quickly moved more than 300 people from their flooded homes to safety. UPDATE 6 p.m.: Reuters reported the nation’s largest oil refinery is preparing to shut down operations. The Motiva refinery is located in the now projected path of Tropical Storm Harvey in Port Arthur. Per Reuters, Motiva’s Port Arthur refinery, the largest oil refinery in the U.S., is preparing to shut down. UPDATE 5:15 p.m.: Texas Attorney General Ken Paxton may need to look into price gouging allegations after a motel in Robstown, Texas, southwest of Corpus Christi, allegedly tripled room rates in the wake of Hurricane Harvey. Reporters from KXAN TV checked rates for the Texas Best Western Plus motel as Harvey was setting its sights on the Coastal Bend, the Fort Worth Star-Telegram reported. The online published rate was $120 to $149 per night. When the crew arrived on Saturday, they were shocked when the clerk reportedly quoted a price of $321.89 per night. During an interview on CNBC Monday morning, AG Paxton said, “These are things you can’t do in Texas. There are significant penalties if you price gouge in a crisis like this. UPDATE 5 p.m.: Houston Texas’ football star J.J. Watts’ fund raising efforts busted his goal and raised $3.5 million. He set a new goal of $4 million. His original goal was $200,000. UPDATE 4:50 p.m.: The FAA continues to warn drone pilots not to interfere with rescue efforts and hurricane response teams. UPDATE 4:45 p.m.: Texans on horseback come to the aid of a horse trapped in rising water. UPDATE 3:30 p.m.: First Lady Melania Trump arrived in Texas wearing white tennis shoes, leaving her Washington, DC heels behind. UPDATE 3:15 p.m.: Bass Pro Shops donated the use of 80 Tracker boats to aid in water rescues in the flood ravaged region of southeast Texas. The company also donated more than $40,000 in supplies to rescue workers. UPDATE 3 p.m.: The Houston Police Department identified the officer who tragically died when he accidentally drove his patrol car into flood waters as Sergeant Steve Perez. UPDATE 2:50 p.m.: President Donald Trump arrived in the Texas capital city of Austin for a briefing by State officials on the efforts to deliver recovery services in the wake of Hurricane Harvey. UPDATE 2:45 p.m.: Rescuer jet skis grandma out of her home. UPDATE 2:40 p.m.: 350 alligators escape from East Texas gator farm as flood waters rise. UPDATE 2:35 p.m.: Eastex Freeway (I-69) losts its side barrier to flood waters from Tropical Storm Harvey. The damage occurred on the bridge crossing the San Jacinto River. UPDATE 2:30 p.m.: University professor in Florida fired after he says Hurricane Harvey hit Texas because it voted GOP. UPDATE 2:15 p.m.: Texas State Rep. Mike Schofield reported the Barker Dam will crest at 104 to 104.5 feet. UPDATE 1:45 p.m.: Hat-tip to Jim “MattressMack” McIngvale opened his furniture stores as a shelter. UPDATE 1:30 p.m.: The National Hurricane Center reports Tropical Storm Harvey is picking up forward speed as it gets ready to finally say goodbye to Texas. Harvey is now moving to the NNE (20 degrees) at 8 mph. Maximum sustained winds remain at 45 mph. The center of the storm is located just offshore near the pass between Galveston Island and Bolivar Penisula. The storm is expected to make landfall, again, along the upper Texas coast, near Port Arthur, later Tuesday night. No strengthening is expected prior to landfall. Radar indicates the rainfall is beginning to move out of the Houston metropolitan area that has been ravaged by street flooding for several days. However, flooding from overflowing creeks, bayous, and rivers is expected to continue for several days. The rain guage at Mary’s Creek and Winding Road set a tropical storm rainfall record at 49.2 inches. Rainfall totals of up to 12 inches are expected between Houston and the Louisiana border, moving steadily to the east and north. UPDATE 1:15 p.m.: Following a briefing on storm damage and disaster response, President Donald Trump waved a Texas flag and said “Texas can handle anything” after Hurricane Harvey. UPDATE 12:50 p.m.: Fox 26 Houston reports that a bridge in east Houston that crosses Greens Bayou has collapsed because of the flooding in the area. The bridge was located at Woodforest Blvd and is in the area where a family of six reportedly died when they were swept away by the raging bayou. UPDATE 12:35 p.m.: A man rescues an armadillo after being rescued himself. UPDATE 12:30 p.m.: Local TV crews capture National Guard helicopter dropping a line to rescue people stranded in a flooded out truck. UPDATE 12:20 p.m.: New flooding expected as Addicks Reservoirs flows over spillway. UPDATE 12:15 p.m.: A Houston police officer is believed to have drowned after making a wrong turn and driving into a flooded area on the city’s north side. UPDATE 12:00 p.m.: After previously refusing to open the doors of Lakewood Church to serve as a shelter, Pastor Joel Osteen reversed course and announced on Tuesday his church will provide shelter to those in need. UPDATE 11:45 a.m.: President Donald Trump and First Lady Melania Trump arrived at Corpus Christi, Texas, to tour the damage caused by Hurricane Harvey. UPDATE 11:40 a.m.: The National Hurricane Center reported Tropical Storm Harvey is continuing its march towards the Texas/Louisiana border. Currently, the center of the storm is located just south of Galveston Island and is moving NNE (25 degrees) at five mph. This is both a change in direction and an increase in forward speed indicating the storm is finally beginning to head away from the embattled Texas coast. Forecasters say Harvey will make its second U.S. landfall early Wednesday morning. 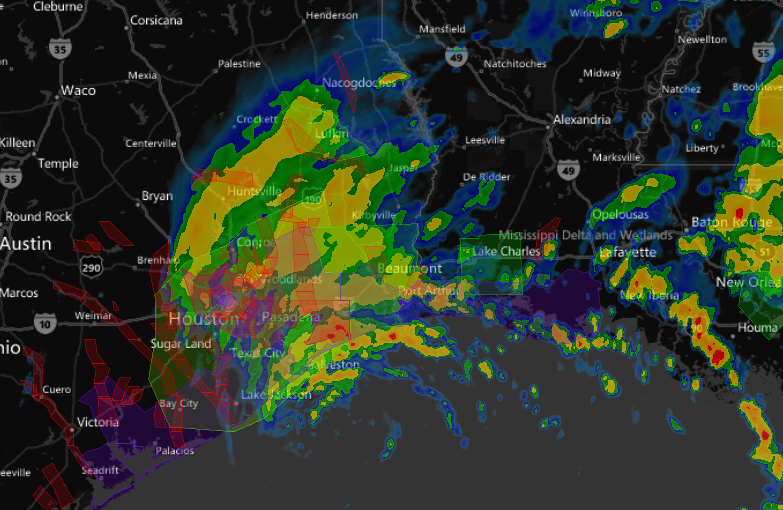 “No significant change in strength is expected” before crossing the northwestern Gulf Coast. Parts of the Houston area have already seen accumulations approaching 50 inches. Fourteen rain gauges in Harris and surrounding counties have reported accumulations in excess of 40 inches since August 24. UPDATE 11:30 a.m.: The National Weather Service reports record rainfall in the Houston area. Mary’s Creet at Winding Road reported a total rain accumulation of 49.2 inches. The previous record was 48″. Several days ago, forecasters predicted accumulations of 50 inches or more. Sustained winds remain at 45 mph. A new Flash Flood Warning has been issued for Galveston Island and Bolivar Peninsula as Tropical Storm Harvey marches northward. UPDATE 11:15 a.m.: Watch as Rockport, Texas, resident Aaron Mitchell talks to his family for the first time after a CNN reporter offered the use of his satellite phone. UPDATE 11:00 a.m.: Radar image shows Harvey’s continued movement to the east-northeast. Rains continue to fall in areas on Houston’s east side and further into Louisiana. UPDATE 10:40 a.m.: Texas National Guard Major General James C. Witham provides an update on Guard activities in the wake of Hurricane Harvey and the ongoing flood event. UPDATE 10:30 a.m.: A Houston police officer drowned in his patrol car Sunday morning while driving to work. The officer, a 30-year police veteran, became trapped in a flooded section of Interstate 45 in the northernmost part of Harris County, the Houston Chronicle reported. UPDATE 10:15 a.m.: Houston Mayor Sylvester Turner reassures illegal aliens they are welcome in the city’s shelters. UPDATE 10:05 a.m.: LEVEE BREACH — Brazoria County officials Tweeted that the levee at Columbia Lakes in Brazoria County breached Tuesday morning. “GET OUT NOW! !,” officials stated. UPDATE 10:00 a.m.: Rockport, Texas, face recovery from near total devastation. Officials report damage to 90 percent of structures in the area. President Donald Trump is expected to visit the region on Tuesday. UPDATE 10: a.m.: President Trump and First Lady Melania Trump, Texas Senators John Cornyn and Ted Cruz, and Texas Governor Greg Abbott and Lt. Governor Dan Patrick will be in Corpus Christi, Texas, to receive a briefing on the Hurricane Harvey response and recovery efforts. Local leadership and relief organizations will be there. Later this afternoon, they will tour the Texas Department of Public Safety Emergency Operations Center in Austin, Texas, the state’s Capitol. Acting Secretary Elaine Duke, Department of Homeland Security; Secretary Ben Carson, Department of Housing and Urban Development; Secretary Tom Price, Department of Health and Human Services; Administrator Linda McMahon, Small Business Administration; and Administrator Brock Long, FEMA, will be attending the briefing. UPDATE 9:50 a.m.: PEOPLE HELPING PEOPLE — Houston icon, Jim “Mattress Mack” McIngvale, opened his furniture store to serve as shelters for Houstonians in need. McIngvale has historically donated generously to community members in times of distress. UPDATE 9:30 a.m.: Houston Police Department aircrews prepare to take to the skies over the city’s flooded regions in search of people in need of rescue. … as ground officers continue their tireless efforts to support their fellow Houstonians. Hebert said emergency workers carried out more than 5,000 rescue evacuations and the county reports no storm-related fatalities. UPDATE 9:00 a.m.: FLOODING IMMINENT, Brazoria County officials warn as Houston reservoirs begin to overflow their banks and the Brazos River rises to record levels. County officials told the Houston Chronicle the river will overflow its banks in hours and flooding is expected to last for days. UPDATE 8:15 a.m.: Celebrities continue to step up to help raise money for disaster relief and the victims of Hurricane Harvey. UPDATE 8:05 a.m.: The George R. Brown Convention Center reached capacity Monday night and was overflowing, the Houston Chronicle reported. The capacity is 5,000 but reports say that 7,000 were at the city’s convention center. Other shelters have opened including at these schools and shelters the city’s local publication reported. UPDATE 8/29 8:00 a.m.: Tropical Storm Harvey continues to move into the Gulf of Mexico and began its turn to the northeast. Moving slowly, 3 mph, the storm is expected to continue dumping rain on the already flooded upper Texas coast through Friday. Harvey is predicted to dump an additional 7 to 13 inches of rain and will accumulate totals of up to 50 inches in Houston and some of its surrounding counties. Texans rallied to help each other, exhibiting the true spirit of self-reliance that makes this state great. Others from across the country have poured in support and manpower to help flood victims. 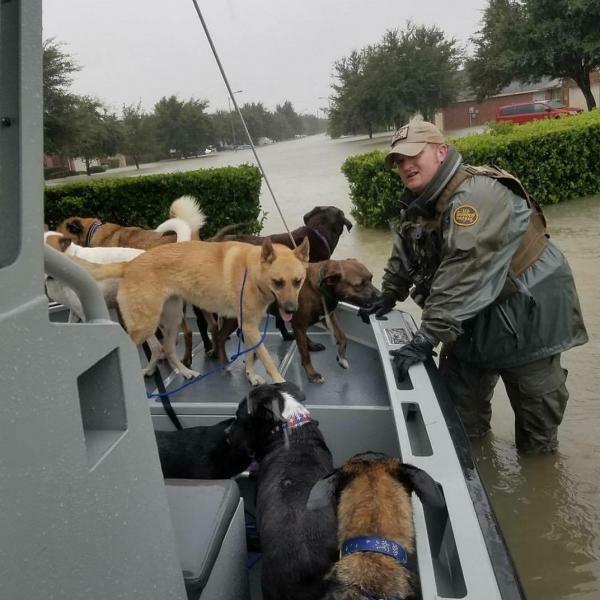 Texas Governor Greg Abbott, in what is believed to be an unprecedented move, activated the entire Texas National Guard to provide assistance throughout the devastated region.